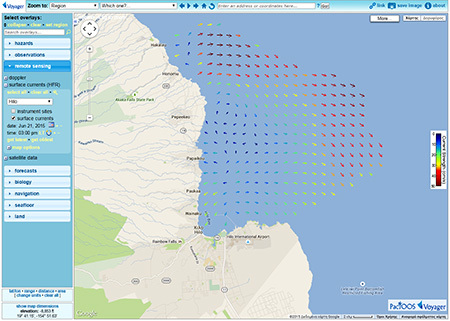 A new data set of the direction and speed of ocean surface currents in Hilo Bay is now available online. The hourly data updates are accessible to the public and free of charge on “Voyager,” the interactive mapping platform of the Pacific Islands Ocean Observing System or PacIOOS. Mapping ocean surface currents in near real-time provides valuable data for search and rescue operations by narrowing down the possible location of a missing person or vessel. The new data set also helps to forecast the distribution of oil or hazardous material spills and is therefore crucial to plan an adequate response. Marine navigation can benefit from near real-time surface currents for safe navigation. Other examples of surface currents data usage include water quality monitoring and forecast modeling. Maps of surface currents, generated by remote sensors on land, are available across the United States as part of a larger network supported by the U.S. Integrated Ocean Observing System (IOOS).